Like most of the homeschool moms I know, I am a curriculum junkie. I want to see, touch and read everything. I want to make sure my kids are getting the best they can. On the other hand, I am quite pleased with the curriculum we used this year. I did a lot of research before I bought any of it and it has all been a really good fit. The only thing I would have changed was our spelling program and I already did that. So, for the most part, the curriculum I buy is 'supporting' stuff. 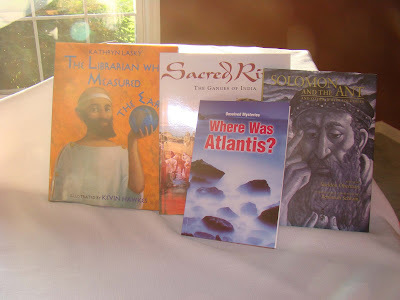 'Regular' books for our library, research material like atlases, wall maps, and other sundries. Today, was our annual big curriculum swap. Here's how it works. Everyone that has something they want to get rid of goes to the venue and sets up a table or blanket and sells their stuff to whoever wants to buy it. Easy, right? The hard part is walking away from books that you really don't need or want. Thankfully, I was on a mission and it was easy for me to walk away, today anyway. I did find some of the curriculum that we need for next year and the boys found some things that they 'needed'. 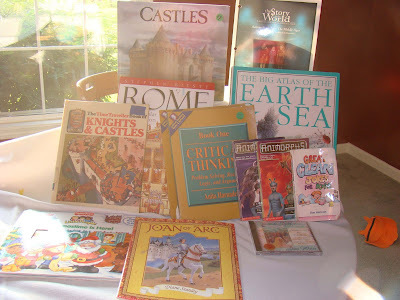 I was especially excited by the Story of the World Activity Book and the Critical Thinking books. I got the Story of the World for 1/2 what it costs and the Critical Thinking for less than that. These are both books I need for next year. Also, that Castles book on the top was a lucky find. Earlier this week, I was looking at it on Amazon. I had it in my cart, but decided to wait on it. It is $16, and I got it for $1!! Yay!!! Then, part of my order from Amazon came in. Xavier is the one that said, "It's like Christmas!" (We're always getting lots of boxes as Christmas time since we live far from everyone.) For what it's worth, I got the Amazon prime membership last August. It costs $79 and you get free two day shipping for a year (not on used books). It has more than payed for itself. I order books at least once a month. Sometimes more often. Having prepaid shipping has really paid off for me. Obviously, if you're only going to order books a couple times a year, it is not worth it. But, if you, like me, have given up on your local library and are trying to build up your personal library, it can be a really good option. Something else I discovered today is Half Price Books. I have not actually been to the store yet, but I have every intention of going next week. They're having a summer reading program for the kids. Plus, they give a 10% discount to educators. Today was a very exciting day for all of us. Tomorrow, back to our regularly scheduled programming: more Florida!